Believe it or not, this is a river in Buenos Aires, the Matanza Riachuelo River in the neighborhood of La Boca! "El Riachuelo" is a rather small river that carries huge problems. It originates in the Province of Buenos Aires until it eventually flows into the Río de la Plata estuary. 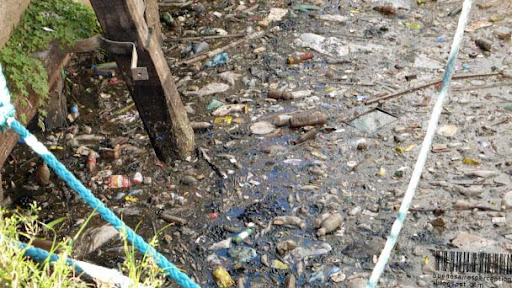 In March the Spanish newspaper "El Mundo" has designated this watercourse as the most polluted river in South America. Crippling poison is your friend! There is probably no chemical you won't find in here: From nitrates, mercury, hexachlorocyclohexane (Lindan), chlorobenzene to tetrachloromethane and bromodichloromethane. It is such a dangerous and stinky mess!!! After a debate about the cleansing of the river that was ongoing for more than 17 years it was announced yesterday that the world bank has finally granted a long awaited loan of US$840 million to Argentina to clean up the Riachuelo. Let's hope that this indispensable step is not further delayed. EW! Most polluted is a distinction I'm sure Buenos Aires is NOT proud of. Hope someone cleans it up soon! I guess every city has its dirty little parts. It can be cleaned up. Not too many years ago it was said you could develop film in Lake Erie...but today, that's all changed. Good luck. It's an ongoing problem due to the lack of our politicians to enact decent laws and enforce them. Oooh! I thought I had seen polluted rivers in India back in the 1980's but this is something else! But...if they can get fish back in the river Thames in London they can do it for the Riachuelo! yikes! A good photo to remind people about pollution and earth day, which is needed everyday. I am glad you enjoyed the barrel cactus with the pineapple fruit on my site. There are more than 5 million people who must live in the Riachuelo Basin. It is a huge disaster. 75% of the inhabitants of that area suffer from diseases related to pollution, ranging from neurological disorders, cancer, to methemoglobinemia, and many, many more. Christ would have to trouble walking in that water. What a travesty. So, so sad that we allow our waterways to become so polluted from our own actions. Thank you for sharing this horrible situation. Matanza seems like the correct word for such a poisonous river. And accroding to this video from Clarin, the air is toxic too. Thanks for posting the video link! Kudos for having the guts to post this picture. I couldn't in my case. It makes me too depressed. Good luck on the efforts of cleaning the river!